As many in the fleet found out last week, the Navy is serious about penny-pinching. The Navy’s No. 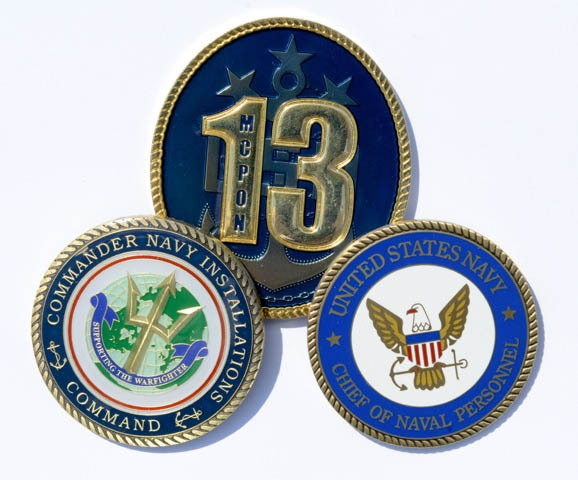 2 officer ordered all commanding officers and senior enlisted to stop using appropriated money to purchase command coins, those treasured tokens that are practically synonymous with command. It also bars them from buying plaques, ball caps and other souvenirs given to sailors and civilians alike. To be sure, skippers can still use official representation funds, earmarked for banquets, or pay out of their own pocket. Not surprisingly, the Navy’s cutbacks have made command coin dealers gloomy about sales through the rest of the year. One large, private mint based in Seattle has already seen a drop-off in orders and estimates that the cutback could dampen sales by up to 10 percent this year. What do you think of the Navy’s move and how will affect you? This cost cutting craze is out of control. Our government throws billions of dollars at corrupt warlords and contractors in Afghanistan and Iraq expecting the money will be stolen. Perhaps some of the money goes to people/groups who kill our soldiers and their countrymen. I am a veteran of DESERT STORM and served on active duty and in the USAR for 31 yrs. I have received challenge coins from commanders I respect and value them. I also give challenge coins to individuals who demonstrate personal traits I value. This is really penny pinching! Like it was before…if a unit, squadron, ship wanted their ball caps, coins, shirts etc., do fundraisers! Coffee, soda, Chiefs, and Wardroom messes can all pitch in. Additionally, MWR needs to move over so that everyone can survive and not take a large percentage of the fundraiser proceeds, because they conflict with the MWR. Coins, ball caps whatever else there may be; these are MORAL boosters regardless of how small they may seem to someone…re-enlistments, awards ceremony or just day to day. Base events, air shows (if any), community activities…whatever the case is; showing command pride goes a long way in unit cohesiveness and commraderie. This is a joke,as a young sailor i had got a coin from Gen Colin Powell in 91 and recieved others over the years and I display them proudly. Maybe the higher ups need to cut back on the parties and their spending. mAYBE CONGRESS AND SENATE SHOULD CONSIDER THERE EXPENSIVE HABITS AS WELL. Free lunchs , dinners and wineing and dineing with special intrest groups on the goverments dime. A less than $5 coin used to say thank you is far more reason to continue with such a tradition. What other way can you give a customized gift for less than that? Nothing new here. This kind of spending was disallowed back in the 70’s when Navy plaques were required to be made out of dental plaster on Tenders if the Navy was to pay for them. USS Hector AR-7 circa 1977 was when I first learned the rules. Onboard the “Count” (USS Comte de Grasse (DD-974)) we bought them separately and one of the chiefs set up a shop to cut all the wood plaque backings. I always served with very talented people and the plaque I received from that Chief I still have and admire. It was made of Purple Heart wood. Thanks Chief!